The campaign to expand Birmingham Airport has gained a new ally – Business Secretary, Vince Cable. The airport recently launched a new London publicity campaign to persuade the Government to throw its support behind Birmingham at the expense of a third runway at Heathrow. Vince Cable said there was no resistance from residents to this expansion to Birmingham building up to being a “really serious international airport”, and this would be a “short-term, pragmatic solution that would bring an awful lot more flights to the country” while extra runway capacity at an airport in the South East could take years to deliver. So Boris has been suggesting a 2nd Stansted runway (opposed even by the aviation industry) and Vince is backing Birmingham, as interim “solutions” to an alleged problem of capacity. The campaign to expand Birmingham Airport has gained a powerful new ally – in the shape of Business Secretary Vince Cable. The flight hub recently launched a new London publicity campaign (see below) to persuade the Government to throw its support behind Birmingham at the expense of a third runway at Heathrow. Mr Cable said in response to the campaign: “Birmingham is very anxious to expand its airport capacity, to build up a really serious international airport, and there is no resistance from residents. Mr Cable said extra runway capacity at an airport in the South East could take years to deliver. He was backed in his calls for expansion at Birmingham by Jim French, chief executive of airline Flybe, the biggest carrier serving regional airports. Mr French said: “We very much see Birmingham as a potential relief valve to Heathrow. Birmingham Airport chief executive Paul Kehoe said: “Heathrow isn’t the only way to fly to new markets. Policymakers have been infatuated with seeing airport expansion in the South East as the only solution. “Heathrow has been throwing its weight about trying to get a third runway, but this reliance on a centralised airport system in the South-East has made the industry too regional, uncompetitive and inflexible. Birmingham Airport’s runway extension will be completed by 2014. A regional airport is launching an ambitious bid to quadruple its passenger numbers to tackle Britain’s aviation needs. Birmingham airport argued that its longer runway would eventually allow 36 million people to use it a year — far more than a third runway at Heathrow would cater for. The West Midlands airport has nine million passengers a year. Its bosses say the passenger numbers could double without any new infrastructure and after its runway extension, due to be completed in 2014, it will have spare capacity for another 27 million passengers. Boris Johnson has clashed with David Cameron over the plans for another runway at Stansted Airport, by saying it would be a ‘fantastic step in the right direction’. Johnson wants the expansion plans at Stansted to go ahead in a bid to solve the South-East’s air capacity crisis. 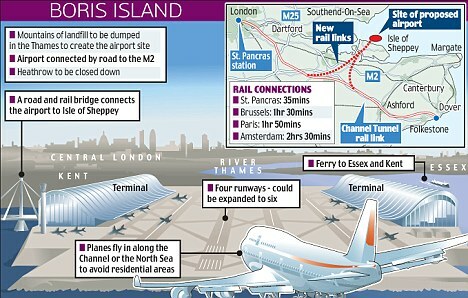 Johnson’s long-term plan is to build a new aiport in the Thames Estuary. He launched an attack on the Government after David Cameron refused to rule out reconsidering expanding Heathrow following the next election in 2015. Johnson accused the Prime Minister of using ‘divide and rule’ tactics and said his comments about a third runway at Heathrow were ‘a ruse designed to dissipate the energy of a campaign for a new airport’. Mr Johnson is the most senior figure to call for a new runway at Stansted. The Crossrail project would be extended to serve the airport. His comments will be seen as an acceptance that the Government will not immediately opt for his favoured solution of a four-runway mega-hub — dubbed Boris Island — to be built in the Thames Estuary. In an interview with New York Magazine published yesterday Mr Johnson again hinted that he may make a bid to lead the Tory Party in the future. In his most outspoken attack yet on the Coalition, Mr Johnson told the Standard he believed Mr Cameron was simply trying to ‘muddy the waters’ by hinting at a possible Heathrow U-turn. He said: ‘The whole decision to re-open [discussion about] Heathrow is designed to cause confusion — to muddy the waters and allow the process to become delayed for as long as possible. It’s a procrastination device. Mr Cameron last week repeated the position in the Coalition agreement of no Heathrow expansion until 2015. But he said MPs should not be ‘blind’ to the need to expand airport capacity. A growing number of backbench Conservative MPs believe a bigger Heathrow is needed to boost Britain’s links to China and other emerging markets. Posted: Tuesday, June 19th, 2012. Filed in General News, News about Airports, Recent News.